52 Week Low - What Does It Mean? What is a "52 week low"? What is the definition of the term "52 week low"? A "52 week low" is the lowest price that a publicly traded security has traded at over the past year (52 weeks). 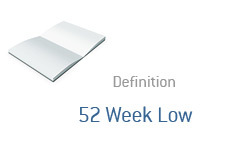 The "52 week low" is generally shown next to the "52 week high" when looking up a stock quote. Type in "AMZN" into the quote screen on a site such as Yahoo! Finance or Google Finance. As of this second, AMZN is currently trading at $128.71, and has a 52 week high of $151.09 and a 52 week low of $73.10. $73.10 represents the lowest level that AMZN has traded at over the past 52 weeks, while $151.09 is the HIGHEST level that it has traded at. As of this moment, Microsoft is currently trading at $28.98. In addition, the stock has a 52 week low of $19.01, and a 52 week high of $31.58. This data means that over the past 52 weeks, Microsoft has traded as low as $19.01 and as high as $31.58.